Atlas ATA Rack Mount Cases are designed to meet the Electronic Industries Alliance (EIA) EIA-310 standard for 19" rack-mount electronics. The rack rails in the non shock rack cases are mounted directly to the inside of the case and does not provide any shock resistance. This style is not recommended for applications where the mounted electronic equipment is heavy or sensitive to shock or vibration. These cases are fabricated and manufactured completely in our warehouse in Denver, CO. Construction consists of tough scuff-resistant ABS plastic laminated to top quality 1/2" plywood, securely fastened utilizing machine driven steel rivets through an aluminum binding, and a weather resistant aluminum tongue and groove closure with recessed hardware. For ease of access to the installed electronics, this style of case has a removable lid on both the front and the back. 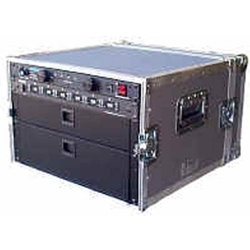 The interior of this case offers a 19U non shock rack space for your equipment. Interior Dimensions18" x 19.25" x 33.25"
Exterior Dimensions25" x 20.25" x 34.25"
Rack Dimensions18" x 19.25" x 33.25"